The power sector needs to re-evaluate capacity addition in the face of surplus power. Electricity distribution companies owned by state governments in India are paying for surplus power that they do not use. This has a significant impact on their finances, as a previous article explained. How did surplus power become such a major problem? Surplus power could arise due to a fall in demand, or increase in power supply. Insights from various states show that the burgeoning surplus is more due to the increase in power generation capacity. The existence of a sustained and significant surplus in many states has been, at times, attributed to the increasing migration of industrial consumers away from power distribution companies to power generating companies. Since 2003, it is possible for large consumers to buy power directly from power generating companies through short-term sales, referred to as open access, as well as from captive power plants linked to an industrial unit. However, most states can attribute only 10% to 20% of backing down (when surplus power cannot be sold, it is backed down, which means power generators lie idle at that time, incurring fixed costs, but generating no electricity) to short-term sales. Additionally, captive power consumption in some surplus states has reduced in the past five years. Another reason often cited is sluggish demand due to a slowdown in industrial growth. However, in the past five years, demand growth has fallen only marginally by 0.9% as compared to previous five years. The major reason for the sustained surplus power is quite simply the massive capacity addition in the past decade, justified on the basis on high anticipated demand growth. 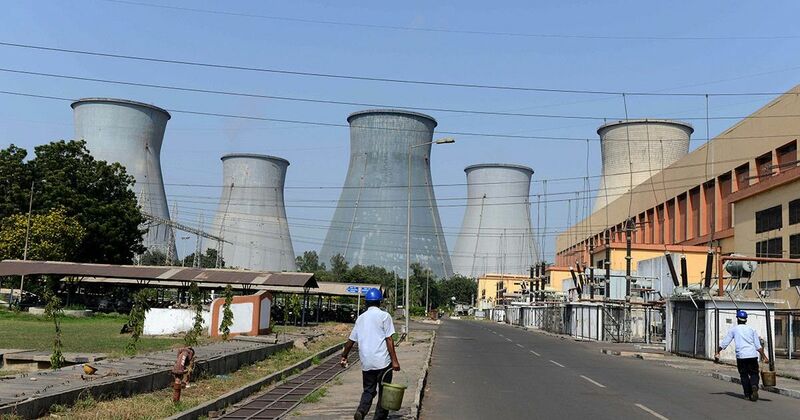 In the past decade, India has seen a significant addition of thermal power capacity – of about 132 gigawatts. This is 1.64 times the installed capacity in 2007. Much of the capacity addition in the past decade was justified on the basis of high projected demand growth. Most State Electricity Regulatory Commissions have regulations to ensure power procurement is based on realistic demand forecasting by distribution companies. 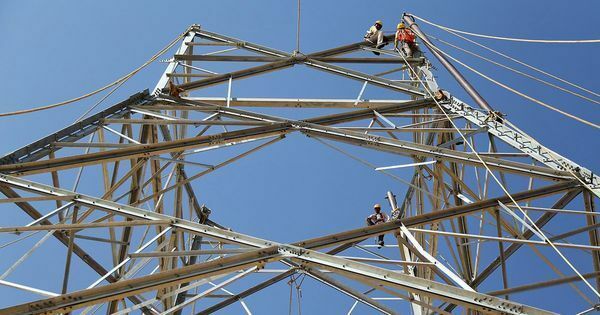 However, distribution companies rely on medium-term and long-term demand estimates of the Central Electricity Authority, published as part of the Electric Power Survey every five years. The chart below chart shows demand projections from the 13th Electric Power Survey to the most recent 18th Electric Power Survey, published in 2011, spanning the period between 1989 and 2022. This is compared with the actual demand from 1989 to 2016, and estimates for 2017. Over the decades, Central Electricity Authority projections have continually over-estimated demand by 30% to 40% for long-term projections. Due to revisions every five years, the demand projections are regularly tempered, but future demand is still based on unrealistically high growth rates. If distribution companies deviated from Central Electricity Authority projections, it has been to project demand at an even higher rate. Such rates were justified on the basis of economic growth, increased industrial demand due to infrastructure projects, impact of campaigns like ‘Make in India’, and the need for power to ensure uninterrupted supply. Despite the justification, it is curious to note that the contribution of such capacity addition to improving supply quality is still not being assessed. Notwithstanding the estimates of future demand, issues with planning power procurement also contributed to surplus power. In many cases, distribution companies contracted long-term “round-the-clock” power when there was a need for seasonal and peak power. This is due to the lack of interest among generators to cater to such requirements. Distribution companies and State Electricity Regulatory Commissions acknowledged the likelihood of contracting surplus power while adding capacity, but relied on the possibility of sale of the surplus capacity to manage this. This strategy, as the first part of this series explained, has not been successful. Distribution companies also contracted additional capacity to address shortages arising from delays in construction of power plants. By nature, such shortages are transient, but to meet the need, long- and medium-term contracts were still signed. By the time the delayed and new capacity came online, or was made available, the demand-supply circumstances had changed and the capacity addition contributed to surplus power. Today, most surplus states still expect substantial capacity to be added by the year 2022 as shown in the table below. In states with significant surplus, the thermal, hydro and nuclear capacity expected by 2022 is about 20% to 30% of the current contracted capacity. In states such as Rajasthan, Andhra Pradesh and Telangana, the expected capacity is 50% to 120% of the current contracted capacity. In the same period, states are also committed to adding massive renewable energy capacity. 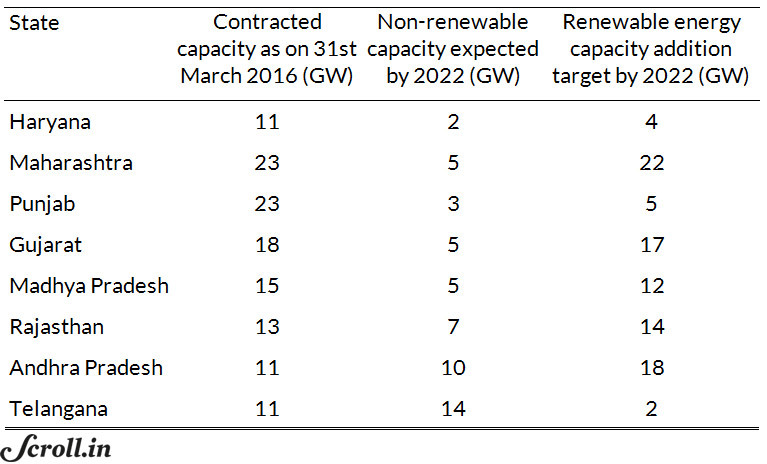 Even if 40% to 60% of the renewable capacity target is met, it will have a substantial impact on backing down. The capacity addition combined with a fall in demand due to rising sales migration will result in more and more surplus power, which will be difficult to manage. To avoid future surplus, distribution companies must conduct robust planning exercises that include separate medium- and long-term forecasts that take into account sales migration, the impact of energy efficiency efforts, tariff elasticity of demand and grid integration of renewable energy. Distribution companies should also take stock of the status of upcoming capacity as well as existing contracts. Power procurement accounts for 75% of all costs of distribution companies, and has an impact on consumers. Therefore, such an exercise should be conducted every alternate year through a process akin to the tariff determination process. Thus, capacity addition plans of distribution companies should be made publicly available, and should be subject to regulatory and public scrutiny through public hearings. Any new power purchase agreements should be signed by distribution companies and approved by State Electricity Regulation Commissions only after such an extensive review is conducted. Additionally, such a process should form the basis for firm and timely exit for delayed projects, if needed. The problem of surplus power will be difficult to address in the years to come on account of resource lock-ins, legal hurdles and huge investments. Therefore, it is imperative that surplus is not managed but avoided. This article is based on The Price of Plenty: Insights from ‘surplus’ power in Indian States, a recently published report by Prayas (Energy Group). The authors are researchers at Prayas.